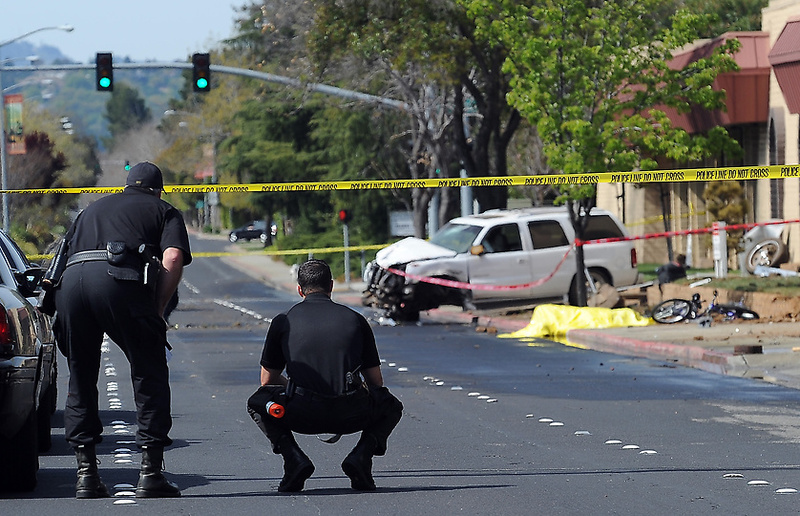 In Concord, California today at approximately 9:30 AM on Treat Boulevard, one of the main roads in the area, a car struck a father and his two daughters as they were on a bike ride. A white SUV, being driven by a 17 year old teenager, was going westward on Treat when the young driver lost control and crashed into a fire hydrant, then hit a 41 year old man and his two young daughters, ages 9 and 12. Contra Costa Country Fire Fighters and Concord Police confirmed that the father was pronounced dead on the scene and his youngest daughter was pronounced dead at John Muir Medical Center upon arrival. His 12 year old daughter is said to be in stable condition with injuries that do not appear to be life threatening. According to Lewis Broschard, the Fire Marshal, witnesses said the white SUV was speeding. The teen driving the car was injured and taken to a local hospital as well, but not the same one as the cyclists. With the fire hydrant being damaged and pouring water, and the location being a crime scene now, police have shut down all lanes going west on Treat until 5 pm. According to the Contra Costa Times, it is being reported that the teen’s identity will not be disclosed because he is a minor at 17. However, they are reporting that he is likely going to be taken into custody and charged with vehicular manslaughter.